"Terrorism" consists of six scenes. A man misses a plane because the police suspect a bomb at the airport. He returns home and finds that his wife is unfaithful. He retaliates in a way that has terrible consequences. The play depicts a daily terrorism and how a distant ruthlessness expands. People are obsessed with moral boundaries to achieve their goals: enjoyment, revenge and money. Passengers glumly wait out a bomb scare at the airport while back home their husbands and wives commit adultery and co-workers hang themselves. A grandmother plots the death of her daughter's "ethnic" husband while her grandson terrorizes the neighbors. 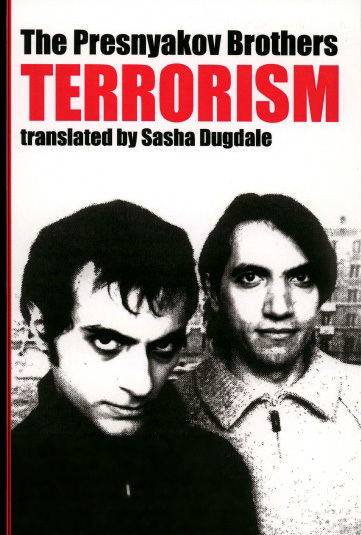 The play "Terrorism" was first staged in Moscow in 2002, then mounted to acclaim the following year at London's Royal Court Theater Upstairs. It is now playing in New York at the Clurman Theater/Theater Row. There are no explosions onstage except metaphorically. Rather, the play depicts the sort of terrorism that ordinary people inflict on one another, and the fears that allow people to terrorize in everyday life. "Terrorism" depicts people disappointing and then punishing one another; bosses and colleagues mutually terrorized in the banal setting that is corporate life; and law enforcement officers, those society places in charge of its protection, privately mocking our vulnerability. The play's chief hero is billed simply as "Passenger," a man who in the first scene races to an airport only to face long delays from suspected suitcase bombs on the runway. In the second scene, the Passenger's wife and her lover do battle, sexually and literally, back at the apartment, while in the third, the hero's employees grapple with a shocking workplace suicide by one of their colleagues. In later scenes, a grandmother schemes how to break up her daughter's marriage to an "ethnic" son-in-law by poisoning him, and local police investigating a gas explosion swap wickedly perverse photos of the victims.